Quiet spot on the Bay. Dog friendly. Relax under the oaks or on your own screened front porch and enjoy the majestic views mother nature offers on Historic Mobile Bay. Explore the Wildlife Sanctuary or take a walk along the sandy white beaches of the Gulf of Mexico. This lovely modern cottage is located just minutes from Gulf Shores down a quiet shady lane. Golfer's Paradise: Who could ask for more than a beach house and top of the line golf courses! The Peninsula Golf Club is locaed just four miles East. It features 18 holes, a pro shop, and restuarant. In addition you will find tennis courts and a swim fitness center. If you want to change things up a bit try the 36 holes of Pure Palmer Golf at Craft Farms, Cotton Creek, and Cypress Bend just an 15 minute drive away. Want more? Play Kiva Dunes or the Golf Club of the Wharf; both are just five miles away. Outlet Shopping: Ten miles north of Gulf Shores in Foley, Alabama the Tanger Outlet Center features 120 name brand shopping options for the bargain hunter. Brooks Brothers, Calvin Klein, Osh Kosh, SAS, Gap, Banana Republic, Anne Klein, and more. A native of Mobile, Alabama I grew up on two shores spending many days as a child on Pleasure Island and then traveling back and forth on summer days and weekends as a teen and young adult to bask in the sun on the white sandy beaches of Gulf Shores. In 1990 I bought my home on Little Lagoon where I raised my family while teaching high school in the area. Now after retiring from nearly 30 years in education I enjoy inviting others to share the pleasures of the island and the Ft. Morgan peninsula. I am a licensed Realtor in the State of Alabama and proudly work with Exit Realty, Gulf Shores I own this home jointly with my daughter Marguerite who is a Coast Guard search and rescue helocopter pilot, former Navy helicopter pilot and graduate of the United States Naval Academy. While she and her husband can not be here to help with the management she always enjoys coming home for a stay in her grandmother's house. This house is one of several I rent to guests from around the world. Some I own and some belong to friends and neighbors. I have made many friends and always enjoy making new ones. It is my pleasure to see others enjoy a relaxing vacation in a home that is just right for them. This property is special to me because it was my mother's home. All of her life she dreamed of living on the water and at 78 she designed and built this bayfront home. She enjoyed spending the last five years of her life quilting in the front room where she had a beautiful view of Mobile Bay and lots of light from the many windows. She loved sharing her home with others and always enjoyed visitors. I know she would be happy that guests come from all over the world to sit on her front porch and watch the dolphins play. I take pride in the continued care of my mother's home. Guests at this home will see a different side of Gulf Shores. Located on a secluded, quiet, cul de sac this home is truly away from it all yet at the same time close to the beautiful white sandy Gulf beach. Our guests enjoy sitting on the covered dock watching seagulls, pelicans, and dolphins play. They enjoy the shaded screen porch and beautiful moss covered oaks as well as panoramic views and incredible sunsets over Mobile Bay. Guests who wish to walk and swim and relax on the pristine white beaches of the Gulf of Mexico have only a two minute drive to the Bon Secour National Wildlife Preserve to find vast expanses of sparkling white sand. The access at the end of Mobile Street has free parking and a boardwalk over the wide dunes. Shelling, surf fishing and sunbathing are favorite past times. 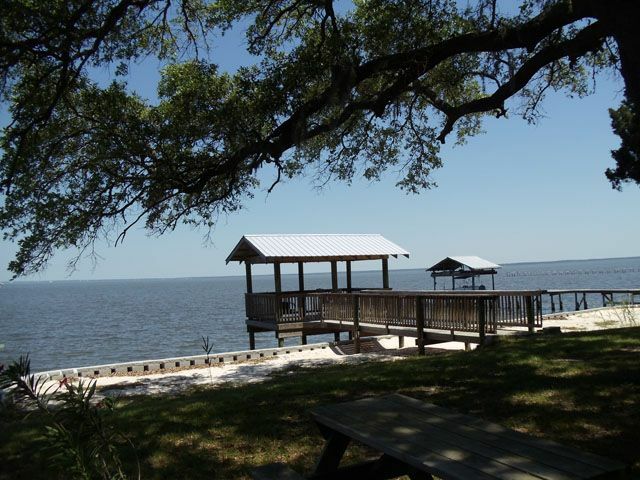 This home is located on beautiful Mobile Bay. The home has panoramic views of the open water. Guest can relax on the private pier and wath seaguls, pelican, herons, and dolphins play in the open waters. Your are sure to enjoy the pier and covered deck. Take your chair out and enjoy the incredible sunsets or toss over a line and catch some fish or crabs for your dinner. We have a crab trap and a big pot to cook them in. The yard has room to park a boat! A public launch is just minutes down Ft Morgan Road. Dogs allowed with additional fee. Limit two. Please ask to see our pet guidelines. No cats. Check in 3 p.m. Check out 10 a.m. Penalties apply for late checkout if not pre-approved. Eight miles down Ft. Morgan Rd. this quiet get away features nearby white sandy beaches, warm Gulf waters, deep sea fishing, surfing, shopping, golf, and seafood restaurants. Quiet bayfront location is just a short distance from the Bon Secour wildlife trail, great golf courses and uncrowded beaches for long walks and hunting sea shells. Historic Fort Morgan is only 10 miles away. Spas and fine dining nearby. Gulf Shores attractions just a 10 minute drive back into town. Refundable $250 deposit returned within 14 days of departure after inspection for weekly rentals. Minimum rental age 25 years. Dogs allowed with additional fee and pre approval. Limit 2 dogs. No cats. The full rental balance is due 30 days prior to scheduled arrival date. If booking an arrival date that is less than 30 days away, entire rent is due at the time of booking.